Nicole set this months main challenge at Scrapping Everyday Miracles. Hi Everyone it is Nicole writing you from above the Arctic Circle in Norway. Well Fall is in full force around here. For this months Main Challenge I want us to be inspired by the Fall season and to look for those everyday miracles around us at this time of year. I want to challenge you to really look for a special moment from the fall season.... maybe something that you could have overlooked or taken for granted. Scrap Twist: This challenge I would like if you could use PAINT on your layout! I know you might be afraid that you will mess it up but that is part of the charm of using paint on your layout! Have fun and get creative! I have taken up your challenge, Nicole, and run with it! oh yeah baby to see you again. Now, this layout is not particularly about Autumn, but more about the feelings and memories that this song brings to the fore. This photo was taken over 20 years ago (ugh, that seems so much longer than it feels) at my dear friend Sherri's 18th birthday party. We had a lovely evening at a fancy restaurant, pretending we were all grown up - although at the time I am sure we thought we were. Lots of years have passed, and we certainly don't see each other or call often enough, but that doesn't mean that we are any less friends now than then. This is just a little message to remind these special ladies that it doesn't matter the time, the distance or the season, you've got a friend in me. Do you like my pretty paper flowers? They were made from recycled brown paper bags and my background corrugated card was the packaging from my new frypan! 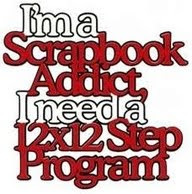 Don't discount anything when you are scrapping, I know that I can't afford to buy all of the fancy new products - as lovely as they are and as much as I'd like to - so I have to work with what I've got, and the results? Not perfect, but effective, and it leaves me a little cash to splurge on the things I really want. Don't forget to check out the other DT blogs and link you own project back to SEM for your chance to win! 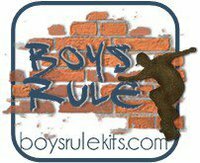 This months challenge is sponsored by Boys Rule kit club, for those of us who have a dirty, grungy, smelly little man to scrap about!